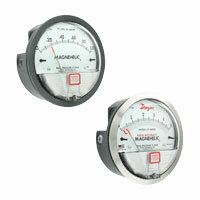 Question: Can the Magnehelic® Differential Pressure Gage handle a temperature of -10°F? Answer: The standard Magnehelic® gage, Series 2000, can only handle ambient and process temperatures down to 20°F (-6.67°C). However, if the Magnehelic® gage is ordered with the low temperature option, the differential pressure gage will be rated down to -20°F (-28°C). In the case of -10°F (-23°C), the low temperature option would need to be ordered by adding “-LT” to the end of the standard Series 2000 part number. If the Magnehelic® gage, equipped with the low temperature option, is operated below -20°F (-28°C), then the accuracy of the gage will deteriorate beyond the published specification due to stiffening of the diaphragm. It is always a good idea to review a product’s complete specifications to ensure compatibility with an application’s requirements. This information and more can be found on the Dwyer website.